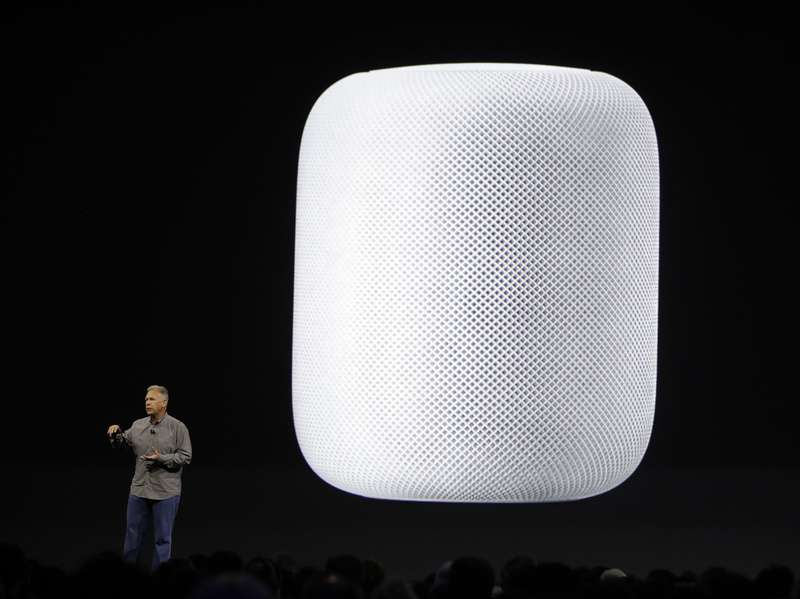 Apple Joins Smart-Speaker Race With Music-Focused 'HomePod' : The Two-Way The speaker is powered by Apple's personal assistant Siri and marks the long-awaited entry of the tech giant into competition with Amazon's and Google's smart home devices. Apple executive Phil Schiller introduces the HomePod speaker at the Apple Worldwide Developers Conference in San Jose, Calif.
Apple has finally unveiled its answer to Amazon's and Google's smart speakers slash digital assistants — and it's called HomePod. This has been one major area in consumer electronics lacking Apple's footprint. Amazon has heavily dominated the field with its home speaker called Echo, which uses the digital assistant Alexa. Google Home followed in October and Microsoft's assistant, Cortana, is also finding a home in home speakers. Both Amazon Echo and Google Home respond to voice commands to play songs, look up stuff online, check the weather, set a reminder or control Internet-connected home appliances. Siri can do those things, too, but Apple's pitch for Siri-powered HomePod is instead focused heavily on music — the company appears to bank on consumers paying for smart speakers that deliver high-quality audio sound as a sort of gateway into the world of smart home assistants. "Just like we did with portable music, we want to reinvent home music," Apple CEO Tim Cook said at the Worldwide Developers Conference, where HomePod was unveiled, becoming Apple's first new device since the release of the Apple Watch in 2015. The HomePod — due to launch in December — looks like a mesh cylinder. Inside is the same processor that powers the iPhone and an upward-facing 4-inch woofer. Pulling music from the Apple library, the speaker was presented as being able to recognize its placement and direct rich audio sound into the room. "Though Apple appears to be playing catch up with Amazon and Google, the primary casualty here may be Sonos. That company offers a similar wireless multi-speaker system for listening to music throughout the home, similar to HomePod's ability to chain together multiple speakers. "A big question mark for the new speaker, though, is whether Siri is good enough to power its own dedicated device. Siri was introduced as a feature in the iPhone 4S in 2011, three years before Amazon came out with Alexa and the Echo. However, Siri has been slow to improve its voice-recognition technology and set of responses, especially compared with the more capable Alexa and Google Assistant. A smart speaker utilizing an underachieving voice assistant could dampen interest in the product." The conference is typically devoted to software updates and this year, Apple released a series of new features and updates for the iPhone, the iPad, Mac and the Apple Watch — including an augmented-reality kit for developers aimed at making the iPhone "the largest AR platform in the world." "New indoor maps of areas like malls and airports indicated that Apple might be laying groundwork to display information over images of those places in the future." The latest version of Apple's Safari browser will be able to stop automatically playing videos as well as online trackers used for advertisers. The company is also launching new models of both the iPad and the Mac computer.